... 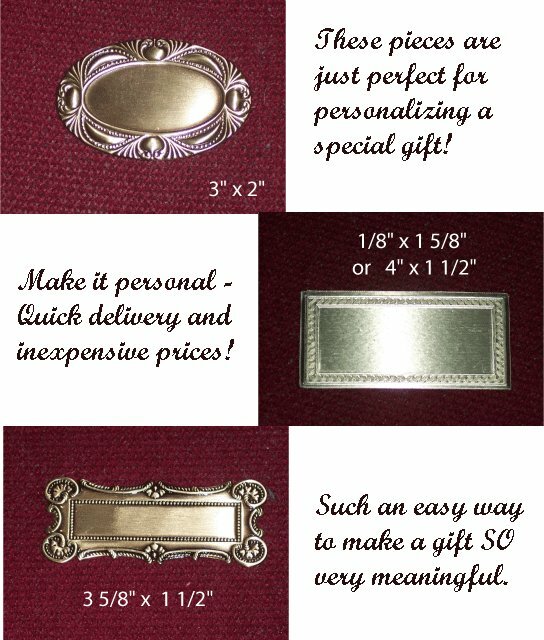 Turn any item into an heirloom ~ with a custom engraved nameplate! Our pre-cut brass will add elegance to that special treasure. 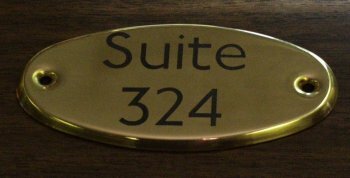 Whether it's a portrait, sculpture, object de-art, jewelry box or other fine item, an engraved brass plate will add quality and class. We also cut brass to order - all day, every day - so don't feel that you must pick one of these die-cut pieces. It costs no more to get EXACTLY the size you want. Scroll down for more information. Note: The bright luster of the two items at the bottom make photography very difficult. They are, though, beautiful pieces! and there's no additional cost!. Size? You tell us. If you didn't see a die-cut piece you liked, let us know. 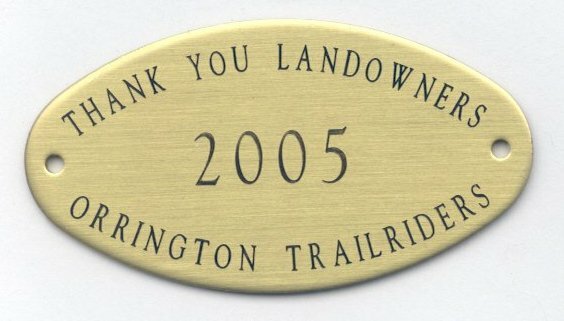 We can engrave in ANY size up to and including 2 feet by 1 1/2 feet! There's no extra charge to cut to YOUR dimensions. We can either size your text to fit the piece or fit the piece to fit your text requirements: either way ~ your choice! Here's a small piece created as a sample. It's 1/2" x 2 1/2" on black brass. What size do YOU need? Fax us your ideas today and we'll give you a quote. You may be pleasantly surprised at how inexpensive such beautiful recognition can really be. Need Door or Wall Signs?